For a classic New York breakfast, a bagel with lox and cream cheese is tough to beat. This dish is fairly high in calories, but you can reduce the number of calories by using a smaller bagel and low-fat cream cheese. For a balanced, healthy meal, make the bagel a whole-wheat one and pair the sandwich with fresh fruit or a salad. The bagel makes up the bulk of the calorie total. One large, 4.5-inch bagel has about 337 calories, while a medium-sized, 3.5-inch bagel has 270 calories. The calorie count is similar for whole-wheat and white bagels, as well as for bagels with toppings such as poppy seeds or onion. 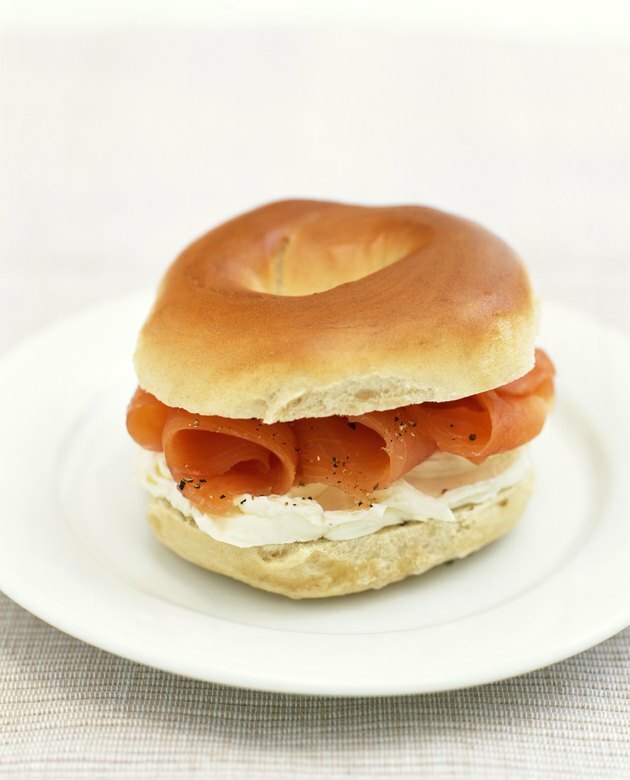 The lox has 99 calories per 3-ounce serving, and the cream cheese has 50 calories per tablespoon. Low-fat cream cheese has just 30 calories per tablespoon. A typical sandwich of a medium bagel with lox and 2 tablespoons of regular cream cheese contains 469 calories.